Apple, which has taken its time developing a strategy for entering the crowded streaming video field, is targeting springtime for the launch of a new streaming clearinghouse, according to multiple reports. UPDATED with executive comments. Apple’s results in the fiscal first quarter edged Wall Street’s estimates, sending shares climbing in after-hours trading. 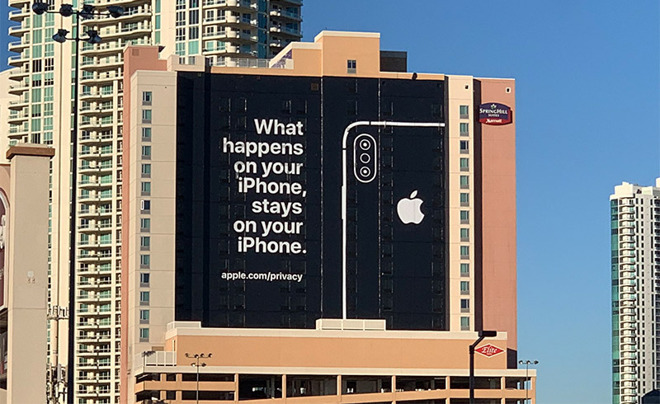 Apple is using an old-fashioned way to capture hearts and minds – it’s put up a large billboard near the Consumer Electronics Show convention center to emphasize its privacy features. UPDATED with closing price. Apple stock plunged to its lowest point in almost two years today, falling 10% after the company warned it would fall short of its own holiday sales forecasts. Apple CEO Tim Cook took the rare step of lowering its sales guidance for the holiday quarter, saying the company had underestimated the challenges in China. President Donald Trump today said he is considering imposing tariffs on Apple iPhones and laptop computers imported from China, a remark that drove the company’s stock lower in after hours trading. Apple’s stock fell 5% today, reaching its lowest level in nearly four months, after key suppliers cut their forecasts citing reduced orders from a major customer. Just in time for the holidays, Apple and Amazon have struck a deal dramatically expanding the selection of Apple devices sold on the e-commerce platform. Ooops. Apple appears to have inadvertently leaked details of the coming generation of iPhones, and new Apple Watch Series 4, on its own product sitemap ahead of today’s hardware announcement. Apple became the first publicly private-sector company in history to reach $1 trillion in market valuation. UPDATED with details from the company’s investor call. Apple is closing in on a $1 trillion market cap following a record June-quarter earnings report that exceeded Wall Street’s projections.